Inder Loves Folk Art: Cannot. Stop. Making. Baby. Pants. These may be my favorite pair yet. They were commissioned by my friend Anne, for her baby girl Maeve. Anne chose the fabrics, and I admit (with some shame) that I was a little skeptical at first - I felt that the two prints would clash a bit at the borders. But then I landed on the idea of using a little bit of contrasting trim at the meeting point (red, of course), and I have to say: Anne has an amazing eye. I want a pair of these for myself, as pajama pants. I love love love them. You may have perceived by now that orange is one of my favorite colors, especially for babies. I do not subscribe to the pink/blue gender divide. I like bright, saturated, gender neutral colors on babies. And stripes. And faux bois. If a pair of pants must be frilly and feminine, they should at least be green. Or orange. Or orange and red, with mixed prints. I don't dislike pink at all (in fact, as a girl, it was LIKE TOTALLY, my VERY FAVORITE color), but it is so overdone. As Anne says, "I like pink, pink is great, but does everything have to be pink?" Rhetorical question: Why is it so important that our babies be recognizable as girls or boys from a mile away? First of all, babies don't care one bit whether they are boys or girls. Second, I don't need to wear pink all the time to assert my femininity. Other colors are allowed! The only reason I can think of to assign gender identity to children from birth is so that we (as a society) can start the gender programming as early as humanly possible. Starting with that 24 week ultrasound if possible! Keep everyone in their place!! Police those babies! This way, no one is the least bit confused about their proper roles! I acknowledge that little girl clothes and little boy clothes are adorable ... perhaps it's as simple as that. But gender neutral clothing is pretty cute too. Let's face it, these balls o' chub would be just as cute in a loin cloth. So I'm not convinced. I wish I had the guts to dress Joe in pink. It would complement his dewy complexion. It's annoying that pink isn't "allowed" for boys. It's a perfectly lovely color, and it is not intrinsically "girly." It doesn't bother me when people think Joe is a girl. I correct them, of course, but it does not bother me. I mean, you have to admit, he is a very pretty little boy! So I also don't understand people who get upset because someone thought their little girl was a little boy for a split second. It's hard to tell. Boys and girls look amazingly alike until puberty. In my opinion, there's no shame in "guessing wrong" or asking gently, "she? or is it he?" It's true that if you don't dress your child in head-to-toe blue or pink (and maybe even if you do), people will guess wrong, but I don't see anything annoying about that. Why do we care so much? Oh, yeah, I almost forgot. Pants. Maeve might be the (second) cutest baby in the whole universe. She is simply delicious. Don't you just want to chew on her chubby arms? That's my boy there, in the overalls. Of course. so cute!!! really gorgeous work there Inder. You could easily quit your day job! You should put Joe in hot pink. it's the greatest color ON EARTH except for the elusive neon salmon. And it's really quite masculine. a real power color if there ever was one. It can't just be any two prints, y'know? But one floral + one geometrical can totally work. Or in this case, one simple floral and one busy floral with matching colors. PS by the way my new favorite thing to do is dress Maeve in pink AND blue, in hopes that it will make some people's heads explode. Dude. I love that dress. I could sew that no problem, in my sleep. How does a mix of blue and pink prints sound to you? Wow! Those pants are fantastic! The colors, the fabric and how it all came together! And to Anne- that dress you linked to is adorable! You are so spot on about the gendering. I thought it might get easier as the Babylady got older, but it seems to have gotten worse. The all-princess-all-the-time stuff makes me crazy. And the "boy" stuff is all-sports-trucks-fire-engines-etc. Why not just plain colors? Stripes? Our rule is still if it is pink, it must be Pink with a Purpose. No pink for the sake of announcing "girl." And if it has any insignia or 'theme' it must be gender neutral if it is sold as "girl" clothes. So, she might wear a dress one day. Jeans and a drum school tshirt the next. Agh, the gendering makes me nuts. And still, at closing in on 3 y/o, if she isn't in "girly" clothes people assume she is a boy. We talk to her a lot of gender expression. We ask her if her "friends" (stuffed duckie, monkey, piggie etc.) are "boys/girls/both/neither." Anyhow... someday I hope to be able to sew like you do! Nice job! I love your gender/color rap. And I love the gender lines getting blurred --even pierced ears don't mean a baby's necessarily a girl. As for hte pants -- I'd wear 'em! Krishna: Don't worry, Helen will have many pairs of home sewn pants. Rebecca: YES. Don't tell Steve, I want it to be a surprise. Meg: I love the "pink with a purpose" concept. My problem is that I like cute frilly pink things, lace, florals, and dresses, even while the insane gender thing drives me nuts. Because I, myself, am a "girly girl." But I guess I think we should allow our kids to make those decisions themselves. My mother can affirm that my love of pink was not foisted upon me - she found it really alarming, actually. Shelby: I should do a whole 'nuther post about how piercing baby's ears is weird on about a million different levels! Durn those are cute pants. 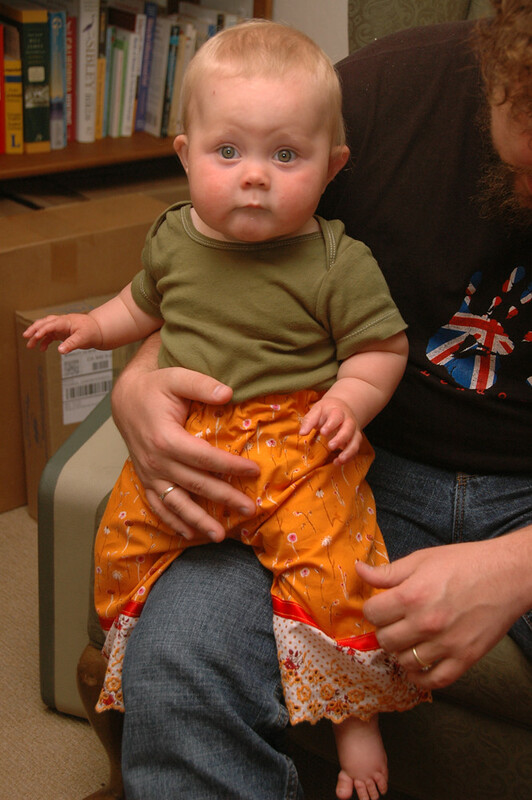 I would definately chew on that baby in those pants if I could. I never dressed my number one daughter in pink. It was hard work. I only wanted her to wear gender neutral clothes or something slightly girly, like blue shoes with a blue bird on them. It came in handy when number two came along and was a boy. Now that number three is here, however, I have what could only be described as a hormonal urge to dress her in pink. It's all ruffle-bums and the pinker the better going on over here. I told this to an artist friend of mine and she said, it's not you, it's the baby. ! My son has long, girly hair and EVERYBODY thinks he's a girl. It's funny to me, because he's such a dude. He's just bam bam bam all the time and very muscular and climbing things. I have noticed it seems to cause other people some distress though. In anycase I think babyhood should be spent being utterly gorgeous. Like that baby. In those pants. "In any case I think babyhood should be spent being utterly gorgeous."